The evening of Sunday, July 25, promised a full moon and clear skies. I wanted to hike someplace where I could watch the full moon rising over the mountains at sunset, then ski a nice big run the next day. 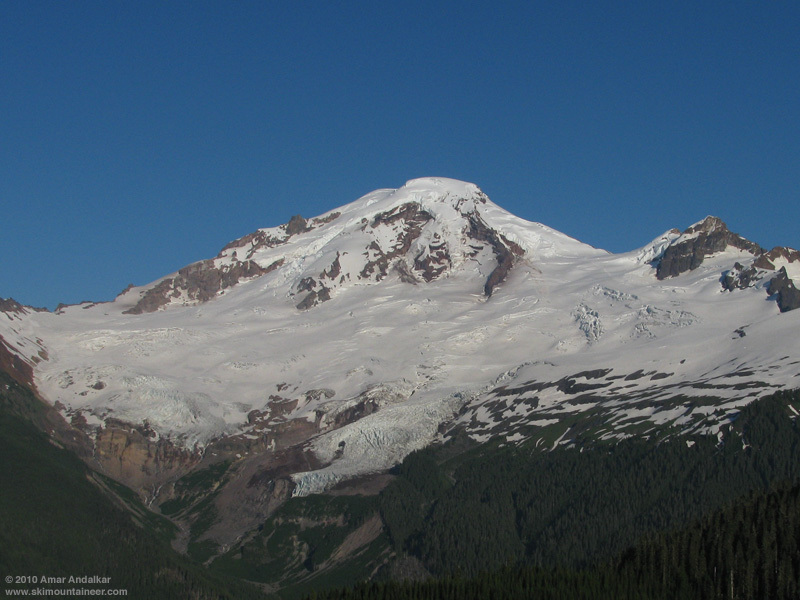 Why not head back to Mount Baker? I'd the skied the peak in superb conditions on Friday (see July 23, 2010, Mt Baker, Squak Glacier Smooth Corn), and doubted that I would find better snow anywhere else. Just for variety, I could try the Coleman Glacier side of the mountain, even though I knew there would be far less snow down low at this time than on the Squak, and therefore much less skiable vertical. The NW side of Baker near the Heliotrope Ridge trailhead area is somehow heavily rain-shadowed, and gets less than half the snowfall and snowdepth of the south side at Schriebers Meadow trailhead. But after a full summer weekend of climbing traffic, there would be a good bootpack in place on the Coleman, making things somewhat safer for a solo trip than the relatively climber-free Squak. My first plan was to hike up Church Mountain (a former lookout site at 6100 ft just north of SR 542) for the sunset and moonrise, then head to the Heliotrope Ridge trailhead to car-camp. Left Seattle around 4pm, and during the drive, decided to change plans. I realized that hiking down from Church Mountain after sunset in the dark (4 miles one-way and 3800 vert) would make for a very late evening, probably not getting to sleep at the trailhead until midnight or so, and would make it hard to get an early start the next morning for the big ski day. What about Lookout Mountain instead? 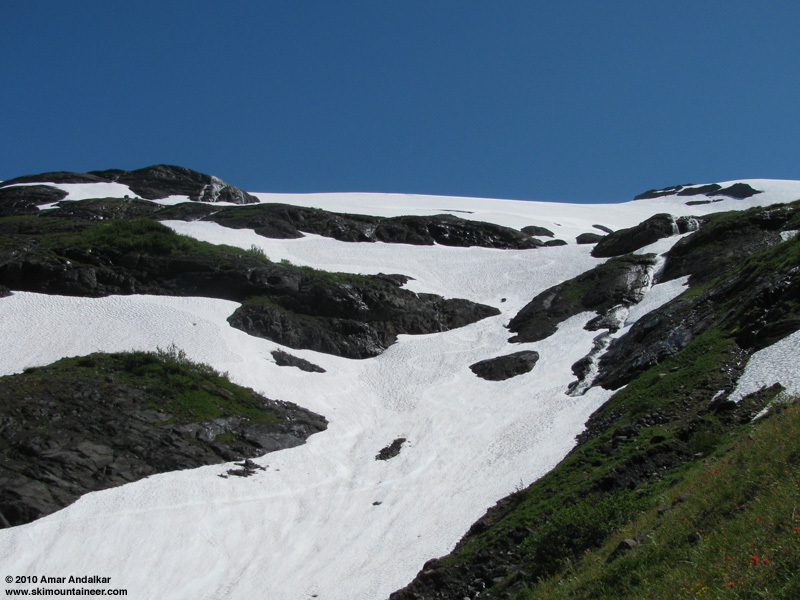 This 5076 ft peak is located off FR 36, which switchbacks off the Glacier Creek Road (FR 39) just a quarter-mile before the Heliotrope trailhead (see topo map). I'd driven that road a few years ago to a 4600 ft saddle just south Coal Pass, and knew that it offered an exceptional view of the northwest side of Mount Baker and the entire expanse of the Coleman Glacier, free of any foreshortening. About 4 miles of good gravel road on FR 36 from the junction, taking the right fork twice, brought me to a final steep stretch which had eroded badly, making 4WD high-clearance helpful (but not necessary) for the last 200 yards. From 4600 ft, the uppermost branch road to the top of Lookout Mountain appeared to be impassable without extreme high-clearance and off-road capability, so I parked and hiked the last half-mile on foot, quite a pleasant short hike. Lots of mosquitoes though near the summit, enough to be annoying and make photography difficult. The sunset and twilight was excellent, with views of both Baker and Puget Sound from various points near the summit, but unfortunately I missed the moonrise entirely -- I think that from this angle, it rises directly behind Mount Baker at this time of year. Headed down as skies darkened and drove back to the Heliotrope Ridge trailhead, which was completely mosquito-free making for a nice car-camp. Sunset on Mount Baker from atop Lookout Mountain. Woke at 5am the next morning and headed up the trail by 6am. Since the last time I was here in October 2009, the first bridge over Grouse Creek (which was fairly nice anyway) has been replaced with a much fancier and even sturdier model, complete with railings on both sides instead of just one. The first snow patches (and mosquitoes) near the trail were not seen until 5000 ft at the start of the Hogsback, about 1100 ft higher than the first snow along the Scott Paul Trail on Friday, and the trail remained bare until just before Hogsback Camp. Switched over to skinning with ski crampons just after the camp at 5900 ft at the edge of Coleman Glacier, a full 1300 ft higher than on the Squak approach. Reaching skinnable snow at last, just steps past the Hogsback Camp. As forecast, the day had dawned brilliantly sunny but not quite as warm as the weekend. 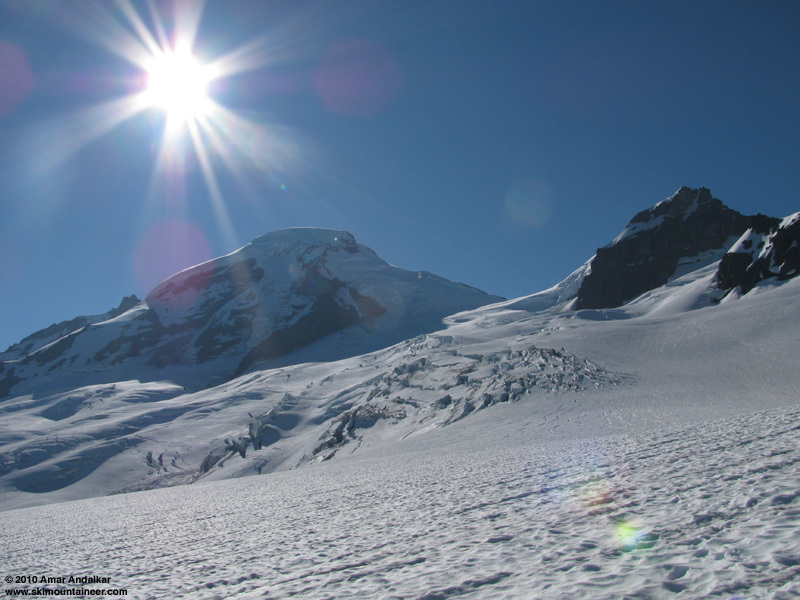 The first steep slope had barely softened enough to skin at 8am, with bright sun and just a slight katabatic breeze flowing down the glacier, but it was manageable. The rest of the route up the glacier from the flats at 6800 ft had a nice bootpack in place, making it easy to skin directly up the track along the long eastward sidehill traverse, or along smooth snow off to the side in other areas. Dozens and dozens of thin crevasses were opening across the bootpack on the flats, but none were of concern on skis, especially since so many climbers had just ascended the route on foot over the previous days. Today was almost empty though, I would see only a pair of descending climbing parties all day, and I was the only skier at all on this side of the mountain. 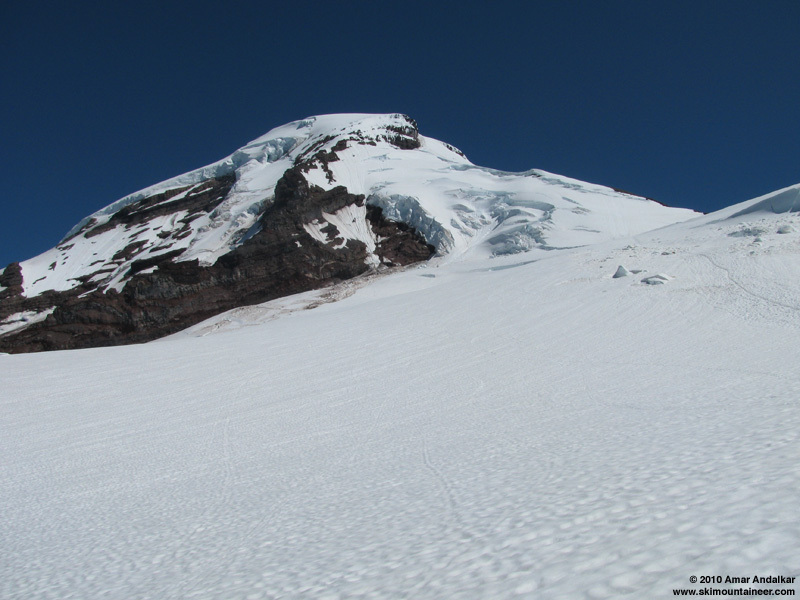 Nice to enjoy such solitude on a major Cascade volcano via a standard route. 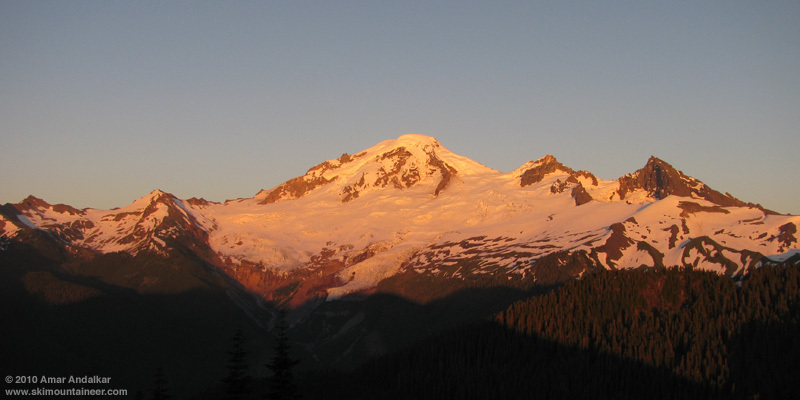 Morning sun rising above Mount Baker and the Coleman Glacier. The slight breeze and northerly aspect kept the snow quite firm during the ascent, but I hoped that it would soften nicely by mid-afternoon. Near 8400 ft where the route passes below Colfax Peak, a large serac fall over the weekend had sent an avalanche of ice and snow right down to the bootpack, with some blocks of ice exceeding car-size. 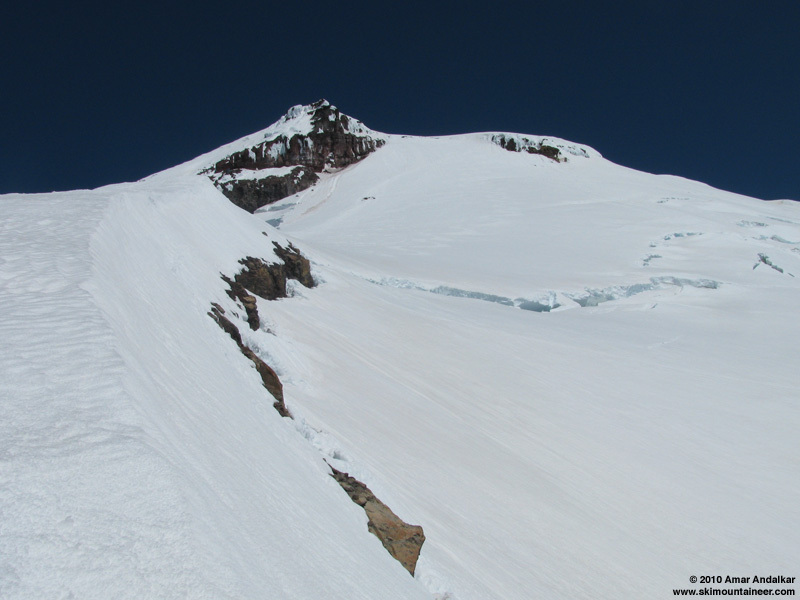 The standard crevasses and bergschrund just below the Coleman-Deming saddle (usually problematic in late summer and fall) were still very well-covered and not an issue yet this year. 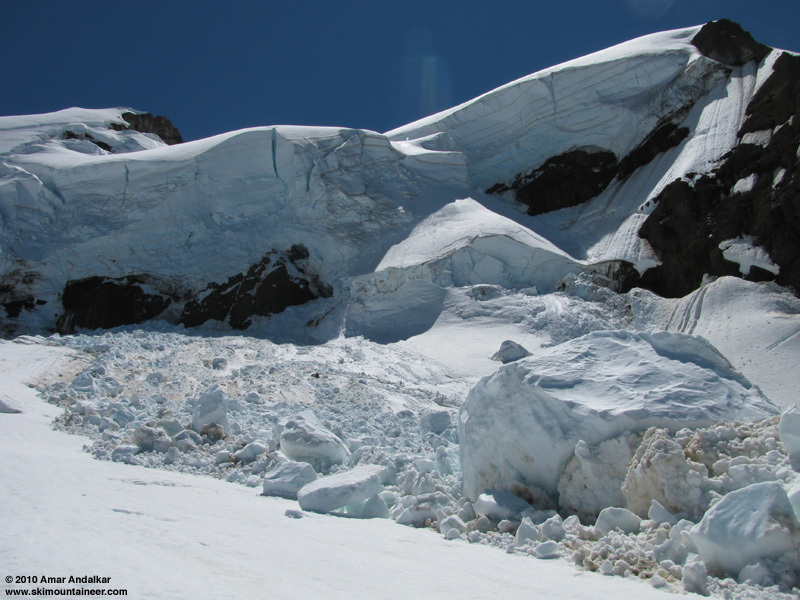 Huge blocks of serac fall debris from Colfax Peak, lying on the Coleman Glacier. By the time I reached the saddle nearing 11am, somehow I'd managed to polish off almost the entire 2.5 liters of water I'd brought, so I stopped for an early lunch and melted another 1.5 liters of snow on the Jetboil. Above the saddle, the first steep NW-facing slope was quite firm and difficult to skin. Even though I wanted another full ski ascent, by 9200 ft it made sense to just put the skis on the pack and crampon up on foot following the nice bootpack. Ascending the staircase of steps up the Roman Wall, a switchbacking skin track from the weekend was obvious, when the 15000 ft freezing level had softened the snow enough to allow easy ski ascents up the face for others. Ascending the ridge above Coleman-Deming saddle, with Colfax Peak and the route up Coleman Glacier far below. As the slope flattened above the Wall near 10500 ft, I switched back to skis and skinned across the summit dome and on to Grant Peak, arriving around 1:15pm. As expected, quite a bit slower than my trip up the Squak, but there was little rush today given the firm snow on the Coleman which needed plenty of time to soften. Just glorious and beautiful atop the summit, nearly calm with temps around 40 �F, really comfy and nice. Fairly clear skies permitted expansive views of the North Cascades and Olympics. Skinning across the summit dome towards Grant Peak. Enjoyed the sunshine and solitude for a while atop the peak and then skied down around 1:45pm, traversing back across the entire summit dome the way I had come (I considered avoiding the reascent of the dome by dropping down the eastern side of the Roman Wall and then traversing west partway down, but decided not to). The Roman Wall had softened perfectly, making for lovely fast turns on smooth corn. The SW-facing ridge below that had oversoftened just enough to keep the skiing fun, letting me carve right through the numerous postholes and ski tracks from the weekend. Sweet turns down the Roman Wall and upper Deming Glacier. Dropping onto the Coleman Glacier, the NW aspects at 9000 ft had softened just enough for good turns, and the glacier remained mostly smooth down to about 8000 ft, perfect for arcing big GS turns. Below that, suncups steadily increased in size along the lengthy westward traverse, but had softened enough to keep it tolerable. Not quite as smooth as the Squak had been, but pretty fine skiing conditions overall for late July. 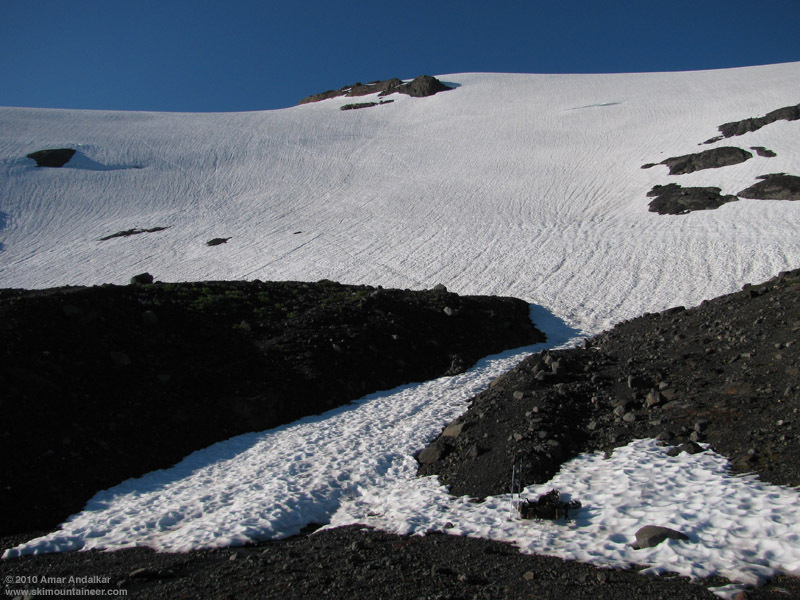 Lots of faint ski tracks in the dimpled barely-softened corn of the Coleman Glacier. As I reached the steep roll above Hogsback Camp, I was determined to ski as much vertical as possible -- there was no way that I was settling for the barely 4900 vert back to where I had skinned up from. During the hike up I'd spotted a nice gully well east of the camp, hosting a lone ski track from the weekend and with continuous snow extending far below the camp elevation. I aimed for the gully, which had a narrow entrance near 5800 ft which would likely melt out within days, and then followed continuous snow down beside a lovely flowing stream and waterfall, all the way to 5300 ft. Nice skiing too, not overly suncupped at all in the gully, a firm surface just softened to corn. Ski tracks down the nice waterfall gully east of the camp. I switched over to hiking boots and began climbing the steep heather slope of the moraine to traverse back to the trail. 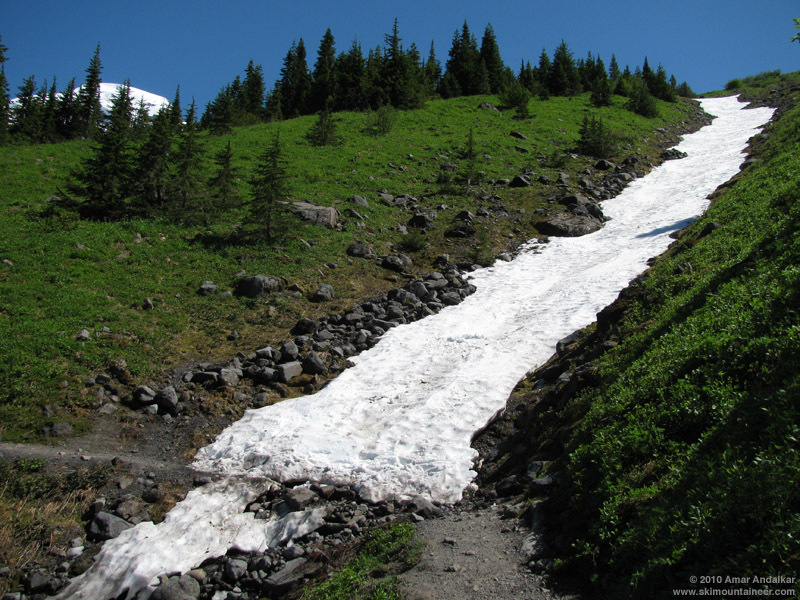 But after crossing the first of several parallel moraines, I immediately arrived at a dilemma: a long finger of snow extended down between two moraines, and I could see that it led directly to the glacier overlook branch trail. It would only take a minute or two to plunge-step down the finger to the trail, but after the first few soft snowy plunges I halted. I just couldn't resist, it had to be done: back up to the top of the snow patch, back on with the ski boots and skis, and soon enjoying another 300 vert of soft creamy turns. All the way down to nearly 5000 ft elevation, bringing the total for the day up to a very respectable 5800 vert of skiing for 7400 ft of effort. Now I was really ready for the hike out! Ski tracks down the last irresistible gully leading to the glacier overlook trail. 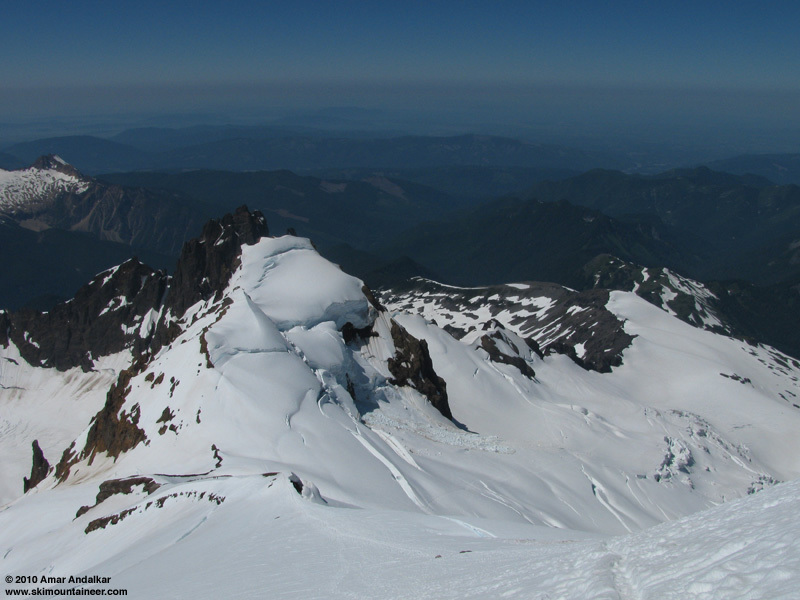 Another great day to be up on Koma Kulshan, and sweet to have skied two fine routes on it in outstanding conditions, only days apart at the end of July. And surprisingly for me given how often I end up soloing other peaks (whether by plan or by happenstance), this was my first solo ascent ever of Baker, on my 15th summit and ski descent since my first time skiing the Easton Glacier in early August 1997. After five summit skis so far this year, it felt like I'd rediscovered what an outstanding year-round ski objective Mount Baker is in most years. Despite its relatively modest elevation, it is truly the king for Turns All Year beyond any other peak in the lower 48, and perhaps even in North America. Thanks for the delayed TR. Maybe I'll get up there before school starts. Still good for a while? Yeah, I skied it yesterday and was blown away by how good it was. 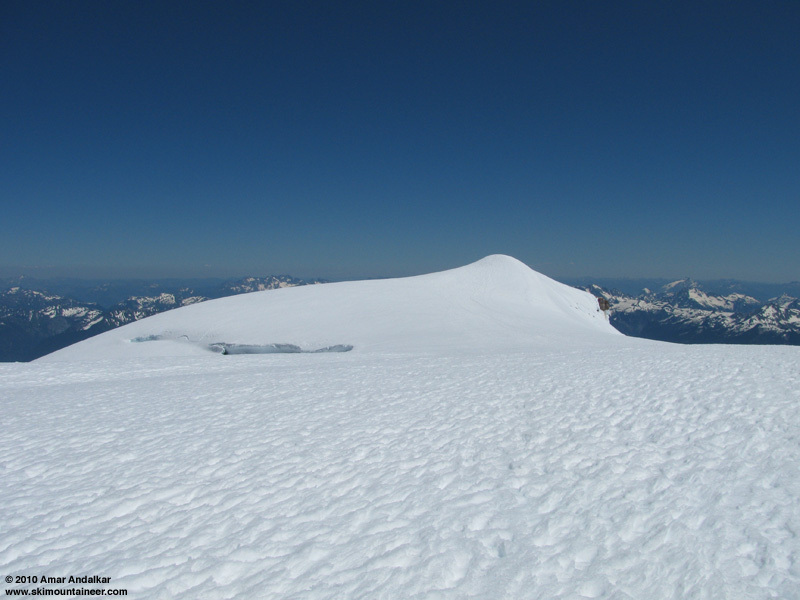 Compared to Amar's photos, the summit dome was smoother; there was much more exposed rock at the top of the Roman Wall; the lower glacier was more suncupped but softened enough that it hardly mattered. And the wildflowers along the moraine are gorgeous!